The image gallery app in Nokia 808 PureView may look the same as before, but it has actually lost some functionality. Photos are displayed in a grid (3 columns) and you can scroll up and down (with kinetic scrolling, of course). You can no longer select multiple photos or share them straight from the grid view. The gallery no longer offers the option to organize images into albums and even the View details option is gone. You can delete, crop, send or share photos with a handy Facebook shortcut available at the bottom of the screen. You can share a photo on Flickr too, but you have to go through the Share menu. 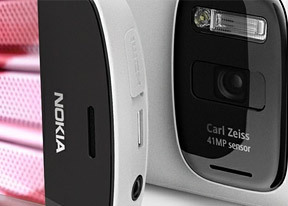 Browsing the images is usually amazingly smooth - you can zoom and pan around 38MP images and the 808 PureView won't break a sweat. Even flicking through hundreds of images in the grid view is fast and effortless. There are only rare occasions when large photos take a while to zoom, but it's nothing major and the overall performance is great. Now that Albums are gone, the only way to organize images is tags. Tags are visible between photos in the grid view and you can insert a new tag with a press and hold. Tags with the date are inserted automatically. Unfortunately, there's no easy way to jump straight to a tag. The Gallery offers simple editing options - adjusting image properties (including an auto-levels feature), cropping, rotating, flipping and resigning, along with adding effects, clipart and frames. The ColorizIt app is also available, which creates a specific effect - a black and white photo with parts of it in color. The Silent Film Director app let's you create old-school looking clips (like a 20's film with the characteristic silent movie soundtrack). The Files app aboard the Nokia 808 is a capable and can basically do anything you want with your files - moving, copying, renaming, sorting, searching or sending - you name it. The ZIP manager also comes in handy when you get an archived file in the mail or need to send several files easily. The music player features a Cover Flow-like interface in several places. You start off by picking an album off a list (or put the phone in landscape mode to browse the albums by their covers in 3D), after that you pick the song you want from the next list, with 3D album covers hovering just above if you change your mind and want another album. Other than Album, you can also browse songs by Genres or Playlists. The now playing interface shows the album art on top (which you can swipe left or right to move between songs), below is the seek bar that lets you scrub through a song, under that are the playback controls. You have equalizer presets but no manual settings, along with Loudness and Balance settings. Feature Pack 1 brings Dolby Headphone sound enhancement, which has only two states - on and off. The Nokia 808 PureView features an FM radio transmitter, which allows you to broadcast to any FM radio receiver nearby (typically, your car's audio). You can set the frequency too, to avoid interferences on the current channel. The FM radio on Nokia 808 PureView comes with a neat and simple interface. You can skip preset and new stations alike with swipe gestures or you can use the virtual buttons. The radio has RDS support and automatic rescanning. What it doesn't have is a built-in antenna, so you'll need to plug in headphones for the radio to work. That would have been a nice perk, but not having it isn't a huge loss. The Nokia 808 PureView audio output is quite great, the handset doing quite well in both of our testing scenarios. 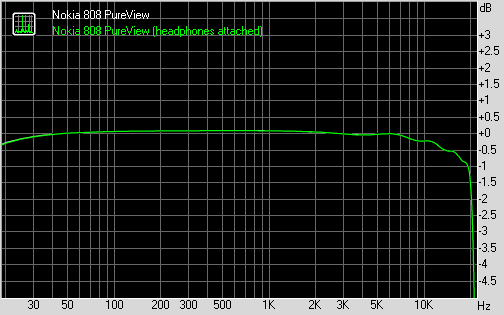 When attached to an active external equalizer, the 808 PureView got impressive scores all over the place. Its volume level was decently high too, so there's nothing to frown at. The stereo crosstalk reading got the usual hit when when headphones came into play, but apart from that and the increased intermodulation distortion, everytihng remained great. A very solid overall performance indeed. And here comes the table so you can see for yourself. The Nokia 808 PureView handled practically every video file we tried - DivX, XviD, AVI, MKV, MP4 - there's nothing the phone is afraid of. Even 1080p videos played smoothly. Videos with AC3 or DTS sound worked too, even if they trip up most other smartphones. The media player works in fullscreen landscape mode. The beautiful screen with native 16:9 aspect is also more than welcome for truly enjoying your videos - even in broad daylight. But the nHD resolution doesn't do most videos justice, you'll need a microHDMI cable and an HDTV. The video player will automatically detect subtitles and load them up too. There are no options or settings available for the subtitles. Sure, they just work fine most of the time, but if you need to change the encoding, adjust their size or anything else, you're out of luck.